The Pepper Dish was designed by Brad and Judy Niemeyer. 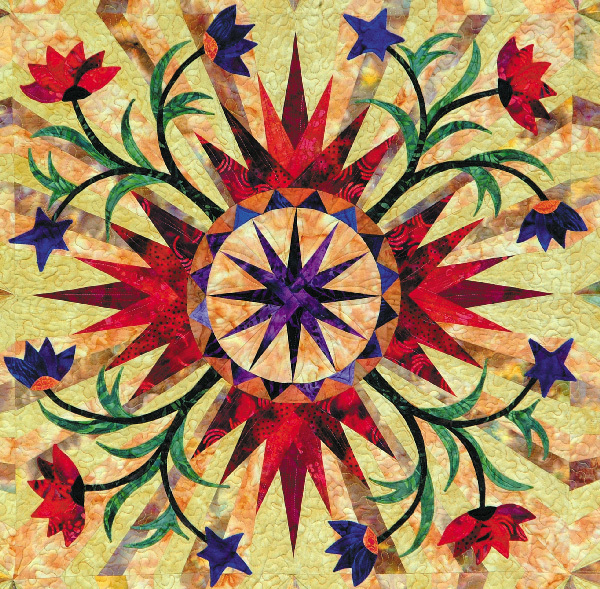 A collection of yellow, red, greens, and purple fabrics designed by Island Batik were used to make the quilt shown on the cover. 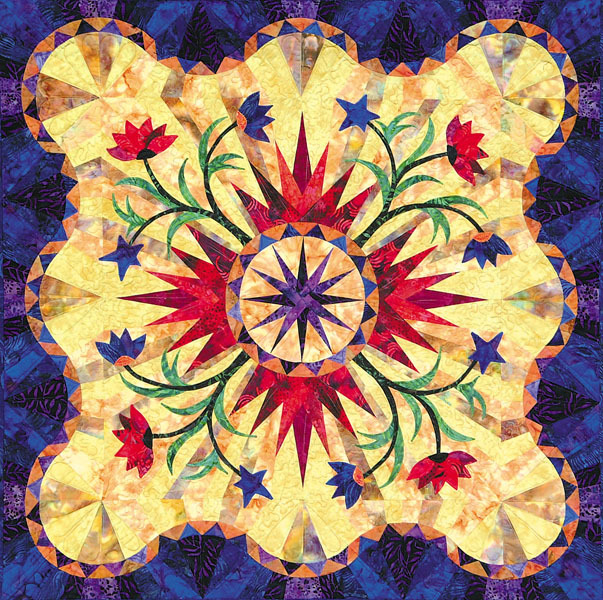 This quilt was designed for foundation paper piecing. Curved piecing, traditional piecing, and appliqué skills are required to finish the quilt top after the foundation piecing is completed. The pattern was written with beginners in mind and has many illustrations and graphics which compliment the written instructions. Judy Meyer I'm making one but can't get the petals very pointy. Ann Marie Mulrooney Hinz Beautiful colors! Deb McGuire So pretty! Wonderful job! Mavis Shanks Love the colors and the quilting. Pepperdish, designed by Quiltworx.com, made by Denise Poslusny. Won First Place at her local guild show. Gerry Casper I have that pattern, but have yet to make it. I love your colors. Lise Foley How do you find time to make all these beautiful guilts? Jenny Thoroughman I'll jsut stand back here and admire it in awe. I am NOT worthy to look at it close. It's beautiful. Kathy Seiler Stunning quilt with exquisite quilting! Cathy Schoner Trumble Oh, wow, wish I could come even close to that! Kathryn Nyquist I’m in awe of these creations by all of you. Joan Sohlstrom Oh my gosh! That is absolutely beautiful!!!!! Nancy Lee Paterson Stunning--most beautiful quilt I have ever seen. Mariette van Biljon Kom Tannie Jackie Guthrie ek is seker Tannie het ook al sulke pragstukke geskep. 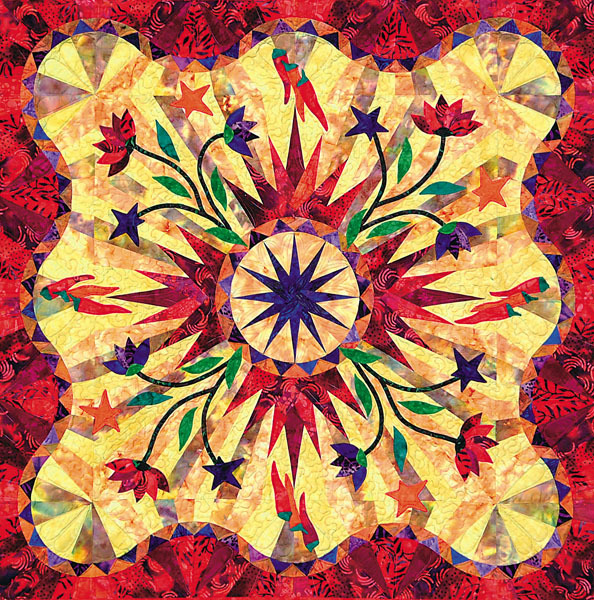 Joe Poore Awesome quilting and beautiful colors! Judith Gilbert This is exquisite!!! Cheri Wilson Is This For Purchase? Penny Olive Now this is incredible!! Mary L. Naccarato Burtchett Gorgeous! Phelan Atlife Oh, Connie! That turned out great! You are so much braver with color than I am, but what a treat! Dorothy L Sand This is simply gorgeous. Meredith Krol This is different. I like it! Anne Meade Have actually made this one, looks great. Susan Lanham Lee Love it Kelly! Susanne Franklin Miyake Great colors!